Extremely Rare OFFICIAL On the Field Eagles Sports Knit hat from New Era. This Vintage hat was extremely limited in quantities. This is what the players wear on the field! 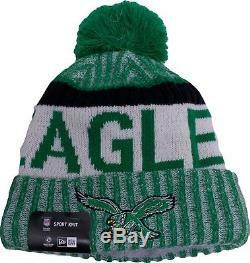 The Philadelphia Eagles vintage sideline beanie from New Era is kelly green, white, and black. 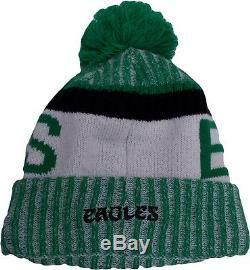 On the front of the Philadelphia Eagles vintage winter beanie, the throwback Philadelphia Eagles logo is embroidered on raised cuff in kelly green, white, black, yellow and brown. The actual crown of the retro vintage Philadelphia Eagles 2017 sideline beanie, features a horizontal white band and the word Eagles in kelly green. The pom of the vintage Philadelphia Eagles 2017 sideline beanie is also kelly green. On the left side of the vintage Philadelphia Eagles 2017 sideline winter hat is the New Era logo. Material: 100% Acrylic - Shell; 90% Polyester/10% Wool - LiningWINTERERA ® technology provides warmth CuffedEmbroidered graphicsFleece linedLiquid chrome NFL logoOne size fits mostPom on topWoven graphicsMachine wash, dry flatOfficially licensedImportedBrand: New EraOn the back of the throwback Eagles 2017 sideline winter beanie is the Eagles wordmark embroidered in black. The interior of the throwback Philadelphia Eagles vintage logo 2017 on-field sideline beanie, is fleece. The comfortable fleece lining of the 2017 Philadelphia Eagles sideline beanie is sure to keep you warm while you watch the birds battle it out on the football field. The item "Philadelphia Eagles 2017 Sports knit Hat New Era NWT Vintage sideline Super Bowl" is in sale since Saturday, January 06, 2018. This item is in the category "Sports Mem, Cards & Fan Shop\Fan Apparel & Souvenirs\Football-NFL". The seller is "melissstrous_0" and is located in Colts Neck, New Jersey. This item can be shipped to United States, Canada, United Kingdom, Bulgaria, Lithuania, Australia, Greece, Portugal, Japan, China, Sweden, France, Hong Kong, Spain, Italy, Germany, Russian federation, Israel, Mexico, Singapore, Norway, Saudi arabia, Ukraine, Malaysia, Brazil, Dominican republic, Denmark, Romania, Slovakia, Czech republic, Finland, Hungary, Latvia, Malta, Estonia, Cyprus, Slovenia, South Korea, Indonesia, Taiwan, South africa, Thailand, Belgium, Ireland, Netherlands, Poland, Austria, New Zealand, Philippines, Switzerland, United arab emirates, Qatar, Kuwait, Bahrain, Croatia, Chile, Colombia, Costa rica, Panama, Trinidad and tobago, Guatemala, El salvador, Honduras, Jamaica.